Migrants trudge along the border fence to a waiting bus after turning themselves in to the Border Patrol at the U.S.-Mexico border near El Paso, Texas. As thousands of migrant parents and children continue to stream across the U.S.-Mexico border every day, the Border Patrol is bringing in more agents and asking the Pentagon for additional help. The Border Patrol says it needs more manpower to care for the migrants — more of whom are coming with infectious illnesses. Homeland Security Secretary Kirstjen Nielsen says agents are on track to stop nearly 100,000 people crossing illegally this month — far exceeding last month's total. The Trump administration is again turning to the Defense Department and plans to request more active-duty troops to help with migrant processing, transportation and medical care in high-crossing areas, according to an official with Customs and Border Protection, or CBP. Trump has already called up active-duty troops on the border to help with surveillance and other duties. A draft of that plan also mentions the need for detention sites and facilities to house migrants on Defense Department land, according to a senior U.S. official. The official said the two agencies are still working out the details. In the El Paso region, the Border Patrol has shut down five highway checkpoints in recent days so the agents can be redeployed to help with the crush of asylum applicants, according to the CBP official. El Paso, Texas, is the newest hot spot for migrant crossings. One day last week, Border Patrol agents say they apprehended 400 people in five minutes. 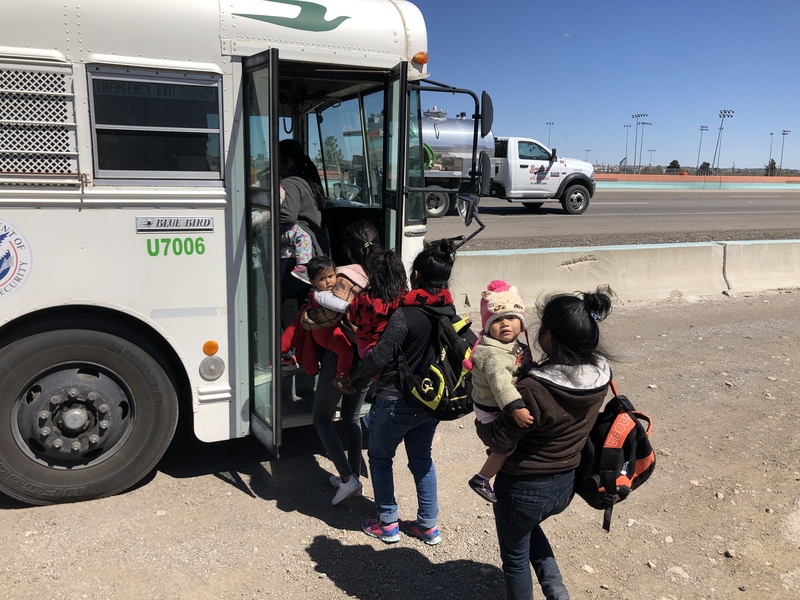 If there is a crisis at the border, it looks like this: a ragged line of 47 men, women and children from Central America wade across the Rio Grande within sight of downtown El Paso. Their clothes are soiled after the long trip north. The infants are bundled up against a biting west wind. They step onto U.S. territory and head straight for the nearest Border Patrol agent to turn themselves in. An officer tells them to follow the border fence to a waiting bus. They comply wordlessly and tramp the final quarter-mile of their arduous journey. "I came with a dream to stay here in the U.S. and get ahead," says Carlos Martinez, holding the hand of his 7-year-old son, Elbin. They're from La Paz, El Salvador. "God brought us here safe and sound. He guarded us on our journey. I don't know what's going to happen now." 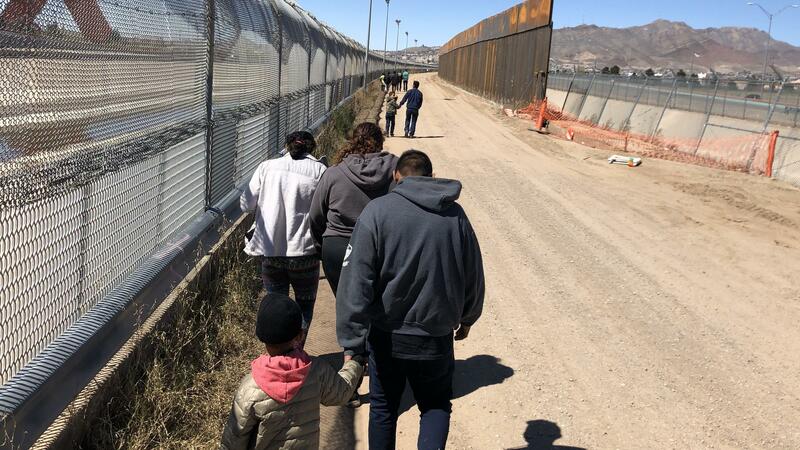 It is easy for these travelers to cross the U.S.-Mexico border here: The international boundary is the shallow river, then there's about 100 yards of no man's land before they reach the government's steel fence on a levee. Beyond that is the historic Texas city El Paso del Norte, the Pass of the North. Despite the administration's insistence that a wall will fix what it calls the "catastrophe" at the border, asylum seekers are undeterred. Ramiro Cordero, a veteran Border Patrol agent and local spokesman, agrees that a border barrier won't stop these immigrants. "Oh, most definitely. We cannot put the fence in the river because it's the river," he says. "We cannot put it right next to the river because it's a floodplain." "Congress needs to change laws, get rid of loopholes," Cordero adds. "If we're allowed to enforce immigration laws and return people to their country of origin, I guarantee you this would stop." Immigrant advocates point out that U.S. and international law allow asylum-seekers, who are fleeing crime and poverty in their home countries, to cross into this country any way they can to ask for protection. "The fact it's happening in larger numbers ... the United States is a beacon of hope. That won't change," says Linda Rivas, director of Las Americas Immigrant Advocacy Center in El Paso. Migrant flows shift constantly. Earlier this year, big groups favored remote stretches of the western border in New Mexico and Arizona. Today, many are crossing into the heart of metropolitan El Paso. Once apprehended, the immigrants are kept in holding cells, sometimes for up to five days, until they can be processed. The harsh conditions of confinement have been well-documented: bad food, no mattresses, frigid temperatures, toilets in the open. Some immigrants call it la perrera — the kennel. "It's now becoming pretty well unanimous that everybody is opposed to the holding cells," says Ruben Garcia, longtime director of a local migrant sanctuary called Annunciation House. These days, he is coordinating a dozen shelters around El Paso that care for migrants after they're released from federal custody to wait for their day in immigration court. Every day, Garcia must find at least 500 beds for these families, who are grateful to be released by the Border Patrol. Migrants crowd into a waiting Border Patrol bus after turning themselves in at the border. They will be taken into custody while their asylum cases are processed. "The overcrowding, inability to control the flu, chicken pox within the holding cells. And everybody agrees and everybody is saying we need to change that," Garcia says. A senior Border Patrol official tells NPR that more migrants are arriving with communicable illnesses such as flu, mumps, impetigo — a rash that occurs among children — and even one case of flesh-eating bacteria. The official says agents are making 50 hospital runs a day with sick immigrants, all along the Southwest border. In December, two Guatemalan children died in Border Patrol custody in separate incidents in the El Paso sector. Since then, there has been criticism that agents are unprepared for the surge of vulnerable immigrants carrying illnesses and that holding facilities lack even basic medical care. "You have to remember that we're law enforcement officers," agent Ramiro Cordero says. "We're not medical technicians. We're not doctors. We all signed up for this job to protect our borders." Since the children's deaths, CBP has sent contract medical personnel and specialists with the U.S. Public Health Service to the busiest border stations to examine and triage sick migrants and get them to hospitals. Back at the fence line, the group of 47 migrants is approached by another agent. "Good afternoon. Welcome to the United States," agent Jesus Morales says to several family members. They appear momentarily nonplussed to hear such a hearty greeting from a gun-toting federal officer. He asks if they have documents to be in the U.S. legally. They don't. So he directs them into the idling Border Patrol bus. "This [happens] probably every 20 minutes," Morales says with a resigned smile. "This is history in the making. In 20 years we'll probably look back at this." The number of asylum-seekers in El Paso continues to grow. Shelter director Ruben Garcia says the government contacted him on Sunday and bumped up its request. He now needs to find spaces for up to 750 migrants every day for the foreseeable future. NPR's Tom Bowman contributed to this report.